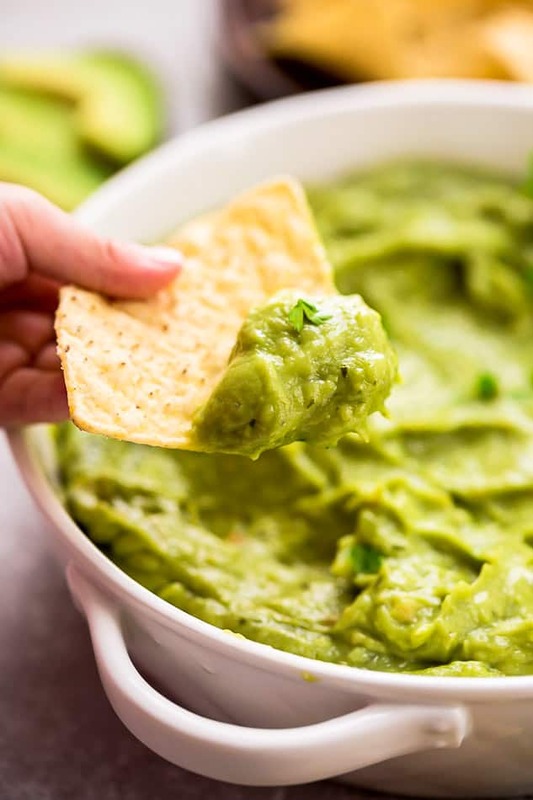 Homemade Guacamole – this quick and simple recipe is the perfect party dip to serve with tortilla chips, tacos or with a spoon. Best of all, only 6 ingredients to make for your next Mexican-inspired meal. Homemade Guacamole is one of those simple recipes that we all need in our arsenal. Especially if you’re an avocado fan like myself? ?? 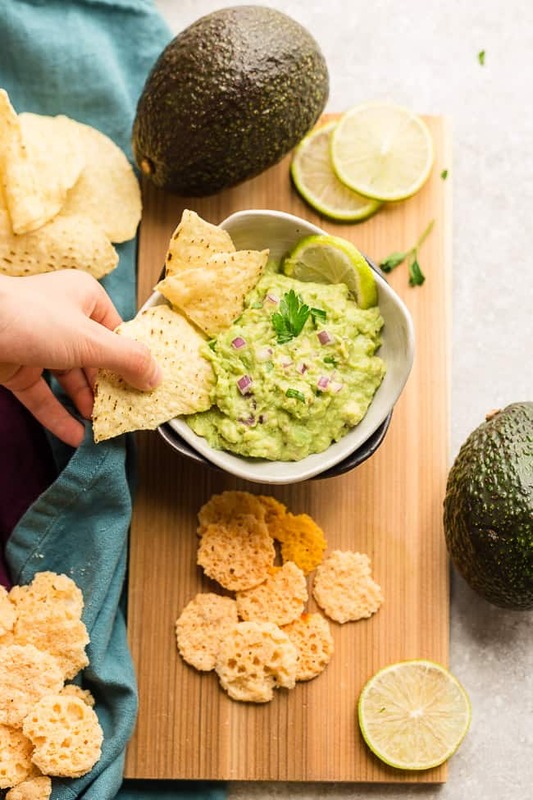 Not only is guacamole healthy and delicious – it also fits perfectly with a vegan, gluten-free, paleo, keto, Whole30 diet. It’s also one of the simplest recipes since you only need a handful of ingredients. My family is obsessed with any kind of guacamole but I think it tastes a million times better when it’s homemade. There are so many versatile ways you can use it too. Serve it with some chips on a platter and you’ve got the perfect party dip for an authentic Mexican fiesta. It also goes perfectly along with tacos, fajitas, salads, by the spoonful or spread some over toast for an easy breakfast or snack. 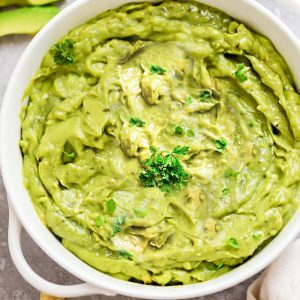 How do you choose the best avocado for guacamole? The key to an amazing tasting guacamole starts with a rip avocado. If you choose one that is under-ripe, it will be hard and inedible. And if you choose one that is too ripe, it will be mushy and brown. The best way to start your search is to look out for the darker avocados and give it a gentle squeeze. If it’s not too hard and gives a little without feeling too hollow or mushy than chances are you’ve found a good one. Next, take a look under the stem. If it looks green, then 99% you’ve got a good one. If it looks brown then it’s past its prime. Pound or process the onions into a paste: Add the onion, pepper, cilantro and salt in a mortar and pestle or food processor. Pound or blend into a fine paste. 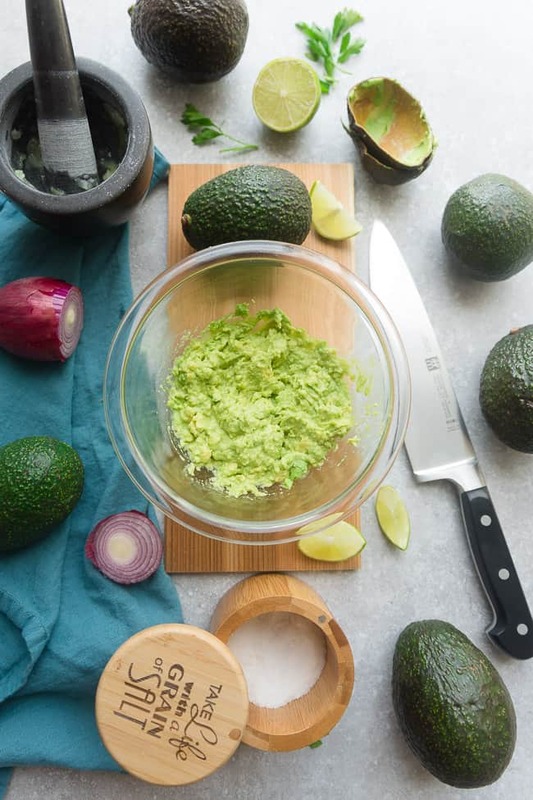 Mash your avocados: Cut the avocados in half, discard the pits and scoop out the flesh into a medium bowl. Mash with a potato masher or large fork until desired consistency (we love it slightly chunky). Mix in the remaining ingredients: Add in the onion mixture along with lime juice and remaining cilantro and stir until combined. Taste and season: Taste and adjust seasonings. For tangier: add more lime juice. What’s the best way to store guacamole? 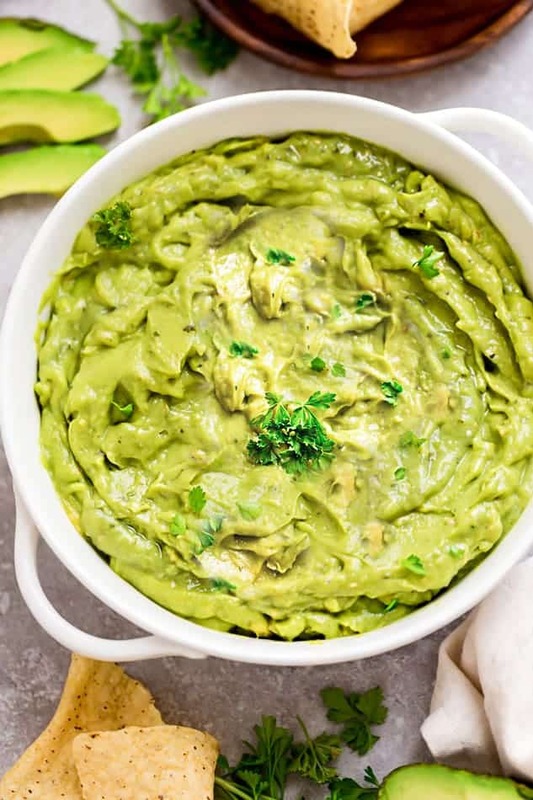 You can make guacamole last for several days without browning by placing a halved onion on top of leftover guacamole then cover the top of the bowl with plastic wrap. The sulfur in the onion prevents the avocado’s browning enzyme from interacting with the air. This little trick allows you to make your guacamole ahead of time. 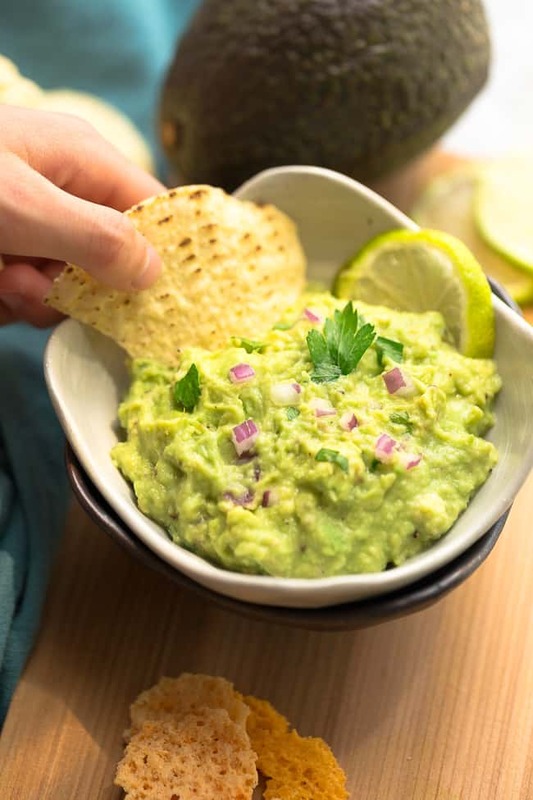 Homemade Guacamole - this quick and simple recipe is the perfect easy party dip with tortilla chips or along with tacos or by the spoonful. Best of all, only 6 ingredients to make for your next Mexican-inspired meal. Place onion, pepper, 1/4 cup cilantro and salt in a mortar and pestle or a small food processor. Pound or process into a fine paste. Scoop out the flesh of the avocados using a spoon into a medium bowl. Roughly mash with a fork. Add the onion paste, remaining cilantro and lime juice. Fold to combine. Taste and add additional salt, lime juice and any optional toppings and seasonings. Serve immediately with warm tortilla chips.